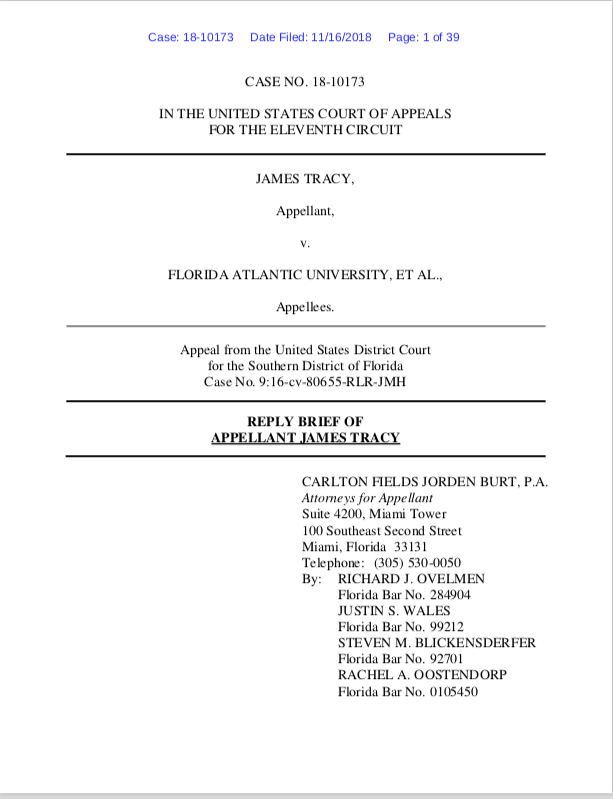 Miami, Florida – Attorneys for James Tracy, a tenured journalism professor fired by state university officials in retaliation for his constitutionally protected personal blogging, have filed a reply brief in the United States Court of Appeals for the Eleventh Circuit. Professor Tracy’s initial appeal brief is available here. To view Appellee Florida Atlantic University’s response brief click here. Tracy was a distinguished tenured faculty member in FAU’s School of Communications who taught journalism history, communication theory, and courses on the media’s coverage of conspiracy theories. Tracy received awards for his work, regularly earned excellent reviews, and was a former president of the FAU faculty union. Holifield was age 7 when he moved from Kentucky to Arkansas and age 17 when he moved from Arkansas to Montebello, California. None of the articles about him indicate he ever graduated from high school or college. He likely never took any classes in physics, science or higher mathematics. He became a lifetime political hack in California. Yet this ignorant political hack, who has been improperly memorialized with buildings, parks and libraries named in his honor, had threatened the late Professor John W. Gofman, M.D., Ph.D., a top physicist, chemist and medical doctor from the top university of the world UC Berkeley, originally from Cleveland, Ohio, who was also a world authority on cancer and public health, along with threatening his associate the late Dr. Arthur Tamplin, Ph.D. a top scientist in bio physics also from UC Berkeley. The ignorant political hack Chet Holifield did not want to hear words from a top medical doctor and physical chemist from UC Berkeley, that building 1000 nuclear power plants was like “premeditated murder”. So instead of acting to protect the public health of the public, this reprehensible ignorant piece of human garbage threatened the messenger rather than attacking the problem. But Gofman stood up to him and all the rest even his own supervisor at Berkeley Nobel Laureate Glen Seaborg, Chairman of the AEC! The rest of this sad story is documented at the above links and more elsewhere. Did this top university on the West Coast attack their top professor and seek to fire him over all these lies and threats by a cheap politician from California but originally from Kentucky? No they didn’t. They supported him to the end when he died in 2007. Gofman was born in 1918 so he was about 89. FAU President John Kelly, Ph.D., who while having orders of magnitude more “education” than the political hack Chet Holifield across the country, behaved at about the same low ignorant level at FAU, seeking to misuse his powers to destroy the basic freedoms and career of Professor James Tracy, Ph.D. for speaking truth to the many public lies about this phony event. Many other lower level hacks at FAU followed suit along with the lying lawyers and judges too. This entire saga is a national disgrace. Let us hope the appeals court will have the guts and intelligence to reverse this gross indignity to Professor Tracy. Boycott Florida Atlantic University. Do not donate one dime to this intellectual cesspool. Do not send your kids there. Do not support this phony institution of lower learning at all. Tell your lawmakers to abolish it and fire all these worthless lying high paid administrators too. It is a disgrace to the search for knowledge, truth and understanding everywhere. Contrast the treatment of the late Professor John W. Gofman, M.D., Ph.D. by the top University of the World on the West Coast UC Berkeley with the gross mistreatment of Professor James Tracy, Ph.D. by the intellectual cesspool Florida Atlantic University on the East Coast. Case Closed! Winfield J. Abbe, A.B., Physics, UC Berkeley, 1961, Ph.D., Physics, UC Riverside, 1966, born Cleveland, Ohio, 1939. Thank you for your most heartening support. MEGA: Made Education Great Again. I’m generally convinced that many who move from the professorate to administration do so simply to improve their family’s resources and life circumstances. They then become used to greater income, take on more debt, and come to the painful realization they have to tow the line of the higher-ups on the boards of trustees to maintain that lifestyle. As you may know in Florida public university & college BOT members are almost entirely affluent political appointees. They often send their children to private schools and universities, and are more excited about college sports than the life of the mind. Administrators are simply no longer the combination academics & volunteer managers they once were. In 2013 the previous FAU president, who despite her shortcomings understood and appreciated the sanctity of free speech and academic freedom, vacated her position, at which time the FAU BOT set out to find a president who was willing to “lay down the law” by intimidating and firing even modestly outspoken faculty. At the same time they supported phony “free speech” projects in sheer “tolerant totalitarian” fashion. I discussed these developments several years ago here. The record now confirms beyond any doubt that this then new president seized upon such unconstitutional and anti-free expression weapons as the “outside employment policy” to carry out exactly what he was tasked to do. 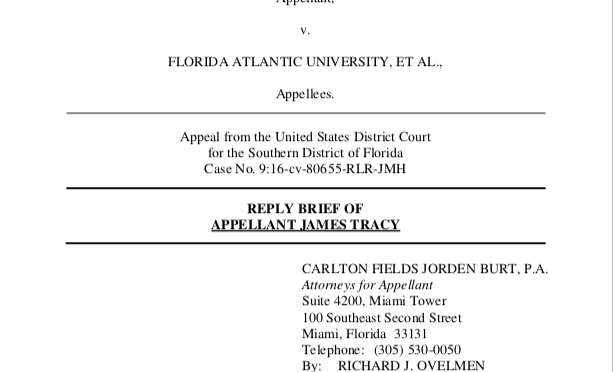 When reading between the TracyVFAU documents, it’s apparent how laughable is the extent to which a brazen FAU went to cover their unconstitutional motives in firing Prof. Tracy, which it then refused to address in the response brief. The Parties involved from this embarrassment of an institution are unthinkingly smug in assuming these communications would remain secret, even warning in writing, “No email on this… NO comments.” How humiliating for them. You’d have to be corrupt not to see this for what it is. Still, there’s hope, I think. I believe I’ve seen that clip. Spence is a hero of our lead attorney Louis Leo IV, and understandably so.